Sweet Let’s talk about chocolates. Not just any chocolate but Italian chocolates. Chocolates like, "Perugina Bacci", "Amedei", "Venchi", "Caffarel", and of course "Ferrero". These chocolates are considered some of the finest chocolates in the world. La Dolce Vita! The sweet life has definitely been perfected by Italians. 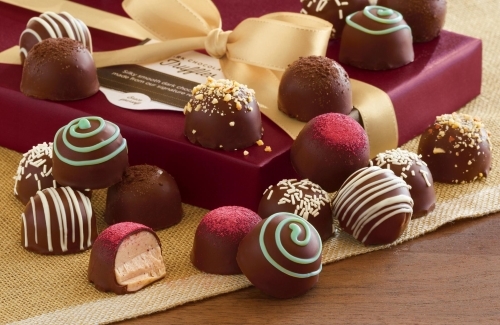 Over the last couple of years, Italian chocolates have increased in demand. The quality of chocolate Italy produces has now surpassed other European countries. These fine chocolates are produced with 100% cocoa butter and no substitute oils. The main chocolate producers of Italy reside in the Piedmont and Umbria regions. The city of Perugia is the home of the Perugina chocolate factory, makers of the world famous Baci chocolate. Baci is a truffle made with a delicious mixture of whipped milk chocolate, nougat and hazelnuts covered in a dark chocolate. Baci is very popular on St. Valentines Day because of the little love notes that are placed inside their wrappers. After all Baci does mean kisses in Italian. The Amedia chocolate factory searches the world for only the best cocoa beans. The Criollo and the Trinitario beans are highly aromatic and consider two of the finest cocoa beans in the world. Amedia processes the cocoa themselves which enables them to get the best results from each type of cocoa bean. This is the reason the Tuscan based Amedia chocolate makers have received the prestigious "Golden Bean" award from the London based "'Academy of Chocolate" for four years in a row. Venchi chocolates was founded in 1878 by Sylvano Venchi. Venchi creates over 180 different types of chocolate but are most famous for their "Rum Cuneesi chocolates". These candies are filled with chocolate and rum paste and is deeply rooted in Italian traditions. Caffarel was established in the city of Turin in 1826. This chocolatier has been producing some of Italy's world class Italian chocolates for over 180 year and if is infamous for their Giaduia chocolates. These candies are made with cocoa and "Tondi Gentili della Langhe" hazelnuts. Tondi Gentili hazelnuts are grown in the Langhe. An area of rural hills in southern Piedmont which provides the perfect soil and climate for growing these delicious little nuts. These hazelnuts are also used in making that great liquor "Frangelico". And now for Ferrero. Pietro Ferrero established his company in 1946 in Turin. He first produced a product called "Pasta giandula" which was a creamy spread made from cocoa and hazelnuts. This product is now called "Nutella" which actually outsells peanut butter worldwide. Ferrero is also famous for their excellent candy "Ferrero Roche", which is a unique praline. This chocolate has a milk chocolate hazelnut shell filled with a creamy milk chocolate center and a whole roasted hazelnut. Well this post lasted a little longer than I expected. I admit I got a little carried away but you can plainly see why Italian chocolates rise above the rest. The quality of ingredients and the tradition of the process is what makes them the best. Don't take my word for it. Just go out and try some today. I don't get paid for endorsements but don't you think I should?